Image © Ben Blacker and DC Comics. Written by Ben Blacker, art by Mirka Andolfo, colors by Marissa Louise, letters by Josh Reed, cover by Joëlle Jones. Through the last few hundred years a coven of witches has been under attack from a group of men called The Architects. We see them first in Salem, Massachusetts in 1692 during the famous witch trials, where the men are trying to kill the witches, who fight back with various amazing black magic powers, but are defeated and die. They keep being reborn in later decades into the 20th century, when one of the current Architects has a new idea. 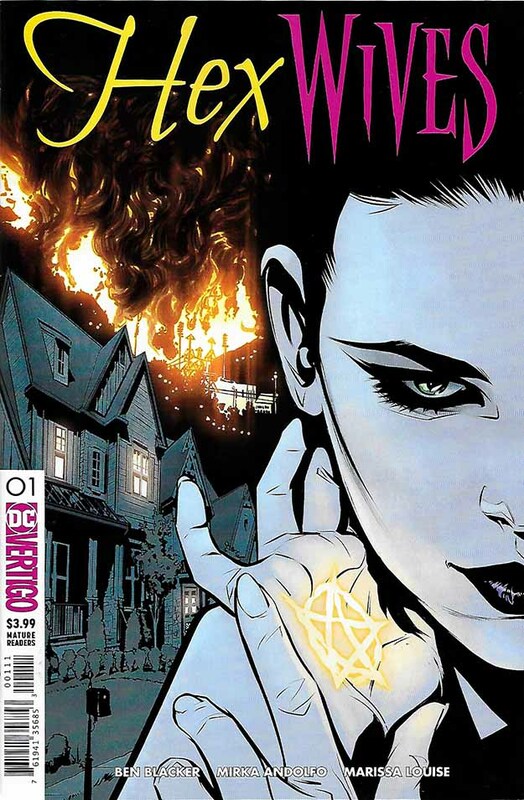 We then switch to a modern suburban development where the women we know are the witches are neighbors, but all seem unaware of their heritage and history. Instead, they act like dutiful wives obeying their husbands in every way, until arcane powers begin to manifest in one of them. The issue is mostly setup, and I will see where it goes from here. The inspiration that might come to mind is the TV show “Bewitched,” but a closer model would be Fritz Leiber’s horror novel “Conjure Wife.” Look up a description of that to see what I mean. One thing that seems to be missing is a reason for the men to be so opposed to the witches. The Salem connection implies a religious reason, but that’s avoided. I will have to see what happens next to decide whether I want to keep on with the series. It has its moments. This entry was posted in Comics, Reviews on April 11, 2019 by Todd.